Annihilator founder and guitarist Jeff Waters has made it to album no. 15 with Suicide Society. Not only is this the band’s 15th release, it is also to first album since 1997 where Waters handles lead vocals. This is not a plus or a negative, as Annihilator is known for stellar guitar work and off the wall thrash rather than vocals. The title track is a bleak commentary about the state of the world. Waters channels his inner Dave Mustaine as this track could be on a Megadeth record. The main riff is simple and grooves along before Waters rips a wild solo over a trashing tempo. Things speed up quickly on “My Revenge” with its meat hook riff and pulsating drums. This is old school thrash done right, with a melodic break in the middle. “Snap” slows things down with a swinging beat and eerie bassline. The urgent chorus and heavy guitar makes this a standout track. The manic “Narcotic Avenue” fits the song title as it deals with drug addiction and its effect on a person. The song twists and turns with off beat time signatures and distorted guitar effects. Suicide Society’s production is very crunchy. Although Annihilator is a guitar oriented band, the bass and drums also share center stage. The effects are minimal, as the group prioritizes musicianship over mood. This works, as all four members are accomplished musicians and the songwriting is solid. There is a slight sense of cheesiness though, as the album has an 80s feel to it. However, there is nothing outdated about Suicide Society. Die-hard Annihilator fans will enjoy the record. It has the thrash and top notch guitar work the band has been noted for since 1984. 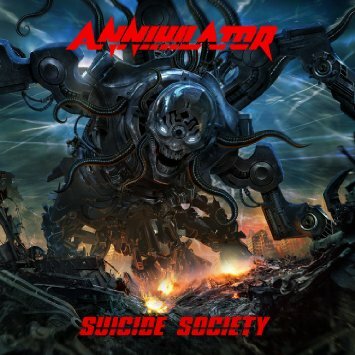 Suicide Society is also a great starting point for those unfamiliar with Annihilator. The songs are heavy and the musicianship is tight. The world may be on the brink of collapse, but Annihilator is going on strong.